The weather is cooling, my eyes are sparkling. I had a great time last Friday for the launch of Chanel’s LES 4 OMBRES Multi-Effect Quadra Eyeshadow. 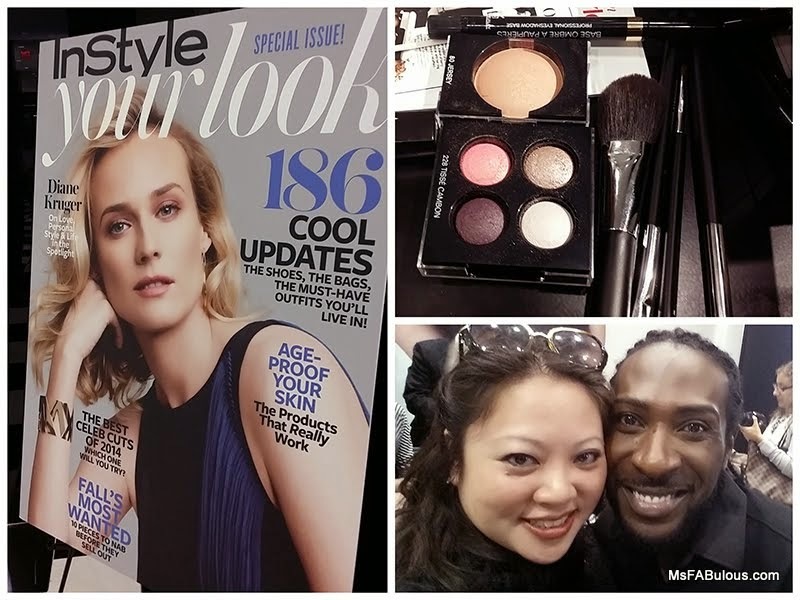 The evening was hosted by InStyle beauty editor Kahlana Barfield who gave beauty fans a rundown on fall makeup trends at the Bloomingdale's counter. The LES 4 OMBRES collection is sets of four vibrant hues inspired by color combinations found in classic Chanel tweed fabric. Celebrated artist Jackie Cooper Jr. chose the Tisse Cambon palette for me. Aside from the pretty combination of bright pink, glittering egglplant, pale rose and taupe, Jackie chose this palette precisely because I shied away from the bold colors in day to day life. He wanted to prove they were easy to incorporate. He gave me great tips for applying eye makeup for a “reverse smoky eye”. Using a primer to help the colors adhere, he advised using a brush in a stipple technique to apply the color to the lid. It has the effect of a stronger, more even application than merely brushing it across the lid. The placement of the pigment is also more precise. He started with the darkest color on the lid, and then blended the bright pink into the crease. This was definitely a different method from the traditional medium tone lid, highlight on the brow bone, that one was always taught. I liked it because it was an easy way to incorporate a super bright shade in an accent for those who are gun-shy like me. A finish all over the lid with some translucent sparkle (the taupe shade in the palette) added a pretty touch. For my brown eyes, Chanel National makeup artist Sterling Williams recommended a deep purple mascara or eyeliner to make the hazel tones of my eyes pop. I guess this goes back to basic color theory you learn in art school, about using the opposite ends of the color spectrum to create contrast. I had to admit I had to refrain from the champagne and multiples of sweets at the event (are style bloggers that predictable? Yes). It doesn’t help your beauty appointment to arrive with bloodshot eyes and sugar crushed (from past experience). The LES 4 OMBRES palettes all had gorgeous selections of coordinating hues that paired perfectly with fall fashion trends. The pigments in these colors were quite intense; makes it easy to create a look with huge impact without having to pile the product on. Now what are your best tricks for a smoky eye?